This Magento tutorial will provide you with comprehensive installation instructions for Magento shopping cart and will also show you how to create and manage a web site using Magento. Magento is a very popular source for online website but not all the people know the definition of Magento.Magento is a very powerful and fast growing ecommerce script, created by Varien. It is an open-source platform using Zend PHP and MySQL databases. Magento offers great flexibility through its modular architecture, is completely scalable and has a wide range of control options that its users appreciate. You can easily integrate Magento into your Google Analytics account and use all its options to analyze the customer behavior on your website and optimize it for better results. You can also use the advanced SEO options of Magento to optimize your website search engine positioning, so it can be found easier by your customers. And if this is not enough, there are over 1.700 extensions for additional functionalities you can install via the Magento-Connect interface. Thanks for instruction, I am wondering if we have other e-commerce system what better than magento? Thank you for this. A very good guide for a person like me who wanted to pursue an online store. I've heard about Magento but not really familiar with it, have no idea how it works, etc... I am thinking of putting up an eCommerce site, is there any system that you can suggest besides Magento? or Magento is the best? thanks in advance for your replies. Its a very important thing i must say,The thing is when we start learning from the things which are fine enough at uses through some creative outcome then having proper knowledge about is more like an important thing and it needs to be done this way. Is magneto only for Stores or can we make normal websites with. Magento is an open-source content management system for eCommerce web sites. 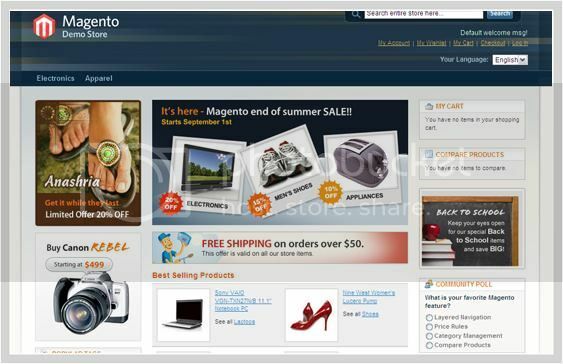 Magneto is a very powerful and fast growing eCommerce script, created by Varien. It is an open-source platform using Zend PHP and MySQL databases. Magneto offers great flexibility through its modular architecture, is completely scalable and has a wide range of control options that its users appreciate. Magento is the best opensource for an eCommerce, online store website. but WordPress is the best for seo? Hi, I guess Magento by default do not have blog. We have to customize it using some extensions. I prefer using Community Edition to get free extensions. Is there any other place to get more interesting blog structures? In Other Word:"Magento is the eCommerce software and platform trusted by the world's leading brands. Grow your online business with Magento." Magento offers adaptable components that can be customized or designed as per the requirements of your online store. The robustness of this platform facilitates us to add or change up to date features to the web store and even allows transformation of the content or information available on the website. Experts who makes use of Magento do not get tired of praising its features that are flexible yet robust that can be operated by anyone who is not essentially aware of technical innovations. Once developed, even the Magento online store owner can add or alter features in the website. It is well-though-out as the most outstanding e-commerce platform because of its varirty of features and one of it is the Zend PHP scripting terminology and MySQL data resource. This scripting terminology reduces the time of development and makes the performance resourceful. A shopping cart is one of the best tools in an online store and Magento offers superior shopping cart solutions. The cart is always visible to the prospective customer and they can add or remove any product with equal easiness. It also displays the calculation of the total price of the items bought that includes the taxes and shipping applicable. This lets the customers make informed choices while shopping and do not feel cheated in any case so they return to your web shop for convenient and upright shopping experience. Magento assists in creating secured transaction gateways like Google Check out, PayPal, Authorize and other protected transaction techniques. Magento is use as open source and if you want to make e commerce website then it is very useful for you. If we want to extend the functionality and features of Magento platform, the best solution here is install a Magento extension. Modules from other software may be is very common and you can see modules anywhere, module is any of a number of distinct but interrelated units from which a program may be built up or into which a complex activity may be analyzed. Helper: This folder include the help files, containing utility methods that will allow you to carry out common tasks on objects and variables. Controllers: This folder include module’s controllers, containing control layers of application flow. They receive input which is users’ requests via HTTP header and then forward the request to the layer directly in charge of processing requirements. etc: This folder include module’s configuration files, containing configuration files of a module (XML file). Based on the configuration file, we can set up or overwrite the old settings just by placing the correct XML tags. Model: This folder include module’s models, Layers providing data and services related to data and business logic. These classes work directly with the database and provide data for other components. sql: This folder include module’s data installation files, containing files of installation and database update of the module database. Besides code folders, we have folders containing files about interface, configuration, language, etc. – layout: (/app/design/frontend/packagename/themesname/layout). Layouts are basic XML files that define the block structure for different pages, as well as controlling the META information and page encoding. This is a importan file of Magento. Layout files are separated on a per-module basis, with every module bringing with it its own layout file. – template: (/app/design/frontend/packagename/themesname/template). Templates are PHTML files that contain (X)HTML markups and any necessary PHP tags to create the logic for the visual presentation of information and features. 404 (directory) – This file includes the default 404 template and skin for Magento, if any one go to a wrong url, the visitor will be move to the 404 page. favicon.ico – This file is for the default favicon for Magento. When customer visit your website, there is a small icon that is shown in the browser’s tool bar. Great Discussion. if i had to say it in one line that would be like "Magento is complete solution for eCommerce Business"
The Magento was originally developed by Varien Inc., a US private company headquartered in Culver City, California, with the world's leading developers and assistance from volunteers. Magento is a very powerful and fast growing ecommerce script, created by Varien. It is an open-source platform using Zend PHP and MySQL databases. Magento offers great flexibility through its modular architecture, is completely scalable and has a wide range of control options that its users appreciate. Magento has everything you will need whether a new start-up business or a bigger established business in Vermont. It has what you will need for long range success while simplifying your e-commerce business. This will make your life easier and that is always a nice bonus with any product.